There have been no significant changes affecting forestry participants in the ETS. The NZ government is planning to review the ETS this year, but the timing for that review has not yet been decided. Many forest owners continue to hold on to some or all of the NZUs they have received. From the 31st May 2015, Kyoto units such as ERUs and CERs can no longer be used in the NZ-ETS. From this date onwards we enter a domestic only ETS, with NZUs and New Zealand AAUs the only valid units for surrender. 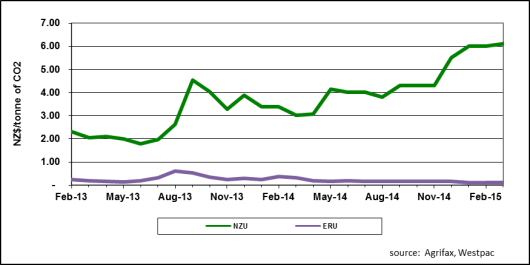 During the past month, NZUs have continued to trade at around $6.00 per NZU with recent lifting to $6.45. Volumes traded are reported to be small. ERUs are currently trading at around $0.10. The only forestry related activities ERUs can now be used for is for surrender liability that is associated with deforestation that was notified prior to the 31st December 2014. Emissions returns for these deforestations are due by the 31st March 2015. For post-1989 forest land participants, the only compulsory requirement under the Climate Change Response Act (2002) is to submit a Mandatory Emissions Return (MER) at the end of each 5 year commitment period. If you are a post-1989 ETS participant, then you have an option to complete a voluntary emissions returns (VER) annually by the 30th June. If you elect to submit a VER, then you will receive the New Zealand Units (NZUs) you are entitled to for the carbon stock changes for both 2013 and 2014, or 2014 only if you submitted a voluntary return last year. If a VER is not submitted, then all units you are entitled to will be received either following the next completed VER or after the next MER which is due in 2018. If you are a Field Measurement Approach (FMA) participant, your participant specific look up table will be used for all emission returns. For those who are not FMA participants the default look up tables will be used. The advantage of submitting a VER is that you will receive the NZUs for the preceding year earlier than if you wait for the allocation after submitting the MER in 2018. This early allocation of units may be of value to you if indeed you want the option to sell these units if prices are high.